For your consideration is a Vienna Acoustics Maestro center channel speaker in black wood grain. All drivers are performing without any issues. This has only been used with high quality amplifiers and never to clipping. The Speaker is in perfect working condition with all speaker drivers in excellent condition. There is also a piece of the finish missing on one of the bottom corners. the final 3 photos are of the bottom. For sale is a pair of Vienna Acoustics Haydn Grand Speakers in mint condition. Speaker are rarely used and most of the time were put in storage. Superb sound quality. You will love the speakers if you love classic music. No reserve bidding. Immediate payment is required. Shipping cost is estimate. Actual shipping will be charged. If you overpay the shipping, difference will be returned to you. Thanks. No speakers, no cabinet. Just the crossover board with all the components on the board. Checked and working fine. For sale is a used Vienna Acoustics Haydn Center. Unit is used but is in good shape. I had bought the speakers brand New to replace the drivers on my baby Beethoven's I had made a error and they're the wrong size. These fit the Beetoven's instead. The speakers are brand new never been used. Please note sold as a pair. Cherry solid wood cabinet. -No other parts or accessories included. Vienna Acousics Meastro Grand Woofer. Condition is New. Shipped with USPS Priority Mail. Beautiful set of Vienna Acoustics Bach floor speakers made in Vienna Austria. Amazing sound for all types of music! Few small scratches as seen in pictures. The serial numbers do not match. Please ask if you have any questions. New VA Schonberg tweeter ring. Up for grabs is a nice pair of Vienna Acoustics Haydn speakers. Serial numbers match which mean the veneer are matching to each speaker. The veneer finish is in okay condition. There are scratches on both speakers and while still looking good, they need work. Mechanically these are flawless and have more bass than my old Polk Audio RTi A7s. Please look up specifications to make sure you can power these efficiently before bidding. Under powering these speakers will cause extensive damage. Thanks! Again they are used in mint condition and working like new, I never play them loud. Very clean main speakers - Tested Flawless - few faint scratches from normal use. Vienna Acoustics Theatro woofer. Condition is New. Shipped with USPS First Class Package. The remarkable Vienna Acoustics cabinetry houses a wealth of technology that allows these slim speakers to provide a rich tonal balance with surprising dynamics and astonishing detail. The Viennese Waltz has been a runaway hit for over two hundred years and is still heard in every corner of Vienna. NIB VA Maestro and Waltz Classic woofers. A pair of Vienna Acoustics Waltz Grand Main/Stereo Speakers achieve a dynamic sound experience for movies and music. The Vienna Acoustics loudspeakers cabinetry houses a wealth of technology that allows these slim speakers to provide a rich tonal balance with surprising audio dynamics and astonishing detail—with or without separate subwoofers. Condition is Used- but in great condition. Small nick on side (shown in picture) barely noticeable. Weight: 16 lbs each. Crossover Components: MKP Capacitors, 1% tolerance. Sensitivity: 91dB. Frequency Response: 70Hz - 22kHz. Vienna Acoustics is distributed in the US by Sumiko, one of the top distributors. Vienna Acoustics 2 way Bookshelf Speakers Model: Haydn. Carefully handmade in Vienna Austria. Small smudge on surface shown, I believe it could be buffed out.This does not affect the integrity of the speakers or even the look in my opinion. VA BBG SE Base kit. 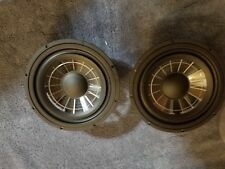 vienna acoustics speakers Set Of 2. Condition is Used. Shipped with USPS Retail Ground. Being the hardest working speaker in a surround system, the quality level of a center channel is of major importance to a system. Film sound springs to life from the Maestro Grand with a naturalness and intensity to match any of the Vienna Acoustics Grand main speakers. Condition is Used. I have 2 pairs of speakers. Crossover System Two Way 6db/12db Bessel. For Sale NIB, never installed Principal Grand Woofer. Vienna Acoustics Mozart Floor Speakers. "I've heard other small speakers that can play loud, but they tend to sound strained, like an old Honda Civic doing 60mph in third gear. The Mozarts just took it all in stride, maintaining clarity and focus at levels that cause most speakers of their size to lose their composure. For Sale NIB Maestro Grand CrossOver. VA Theatro CrossOver, Never installed. Vienna Acoustics Grill-Kiss Lower. Condition is New. Shipped with USPS First Class Package. Vienna Acoustics Grill-Music/Kiss Upper. Condition is New. Shipped with USPS First Class Package. For Sale, New, Vienna Acoustics Waltz CrossOver. Input power: 180W(maxi.). weight: 4kg/pr. Sensitivity: 90dB. WOOFER ONLY! Impedance: 16 ohm. weight: 3kg/pr. Sensitivity: 90dB. For Sale Bach SE Woofer. This a perfectly working Vienna Acoustics Mozart crossover. Listed for part only. It is missing/broken both binding posts. However, it works fine when connecting speaker wires to them. This a perfectly working Vienna Acoustics Mozart crossover. Listed for part only.